Back on April 26, 2007 I blogged about the challenges and down-right fright of flying in small, weight-imblanced planes and drew parallels between imbalanced planes and imbalanced work lives. I also mentioned–in that blog–another air-bourne fright I experienced trying to get home from a speaking engagement in the Bahamas during the first hours of 2004’s Hurricane Alex (and said that that was a story for another day…and so here it is, now!). 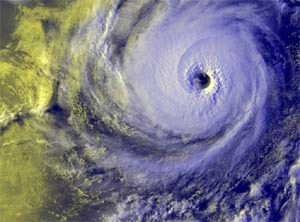 Weather-wise, my August 2, 2004 departure from Paradise Island was stunning–sunny and in the clear blue 80’s. Another scenario, however, was playing out on the mainland Florida coast, where I was to grab a connecting flight home from Miami. All this was immediately apparent upon arrival at Nassau Airport as the place was billowing with stranded passengers waiting to get a flight out. All flights were, at least for the moment, grounded. Of course, this was for everyone’s safety, but a typical reaction from most was, “Great”…and not the good kind of “Great”! The small airport could not accommodate everyone and so it was “shuttles back to the hotels all!” And an extra day or two’s stay commenced. Now call me crazy, but I didn’t want to go back to my hotel! I had another speaking engagement I had to get to within 48 hours and sincerely wished to get home before zipping off again. I pleaded with the ground attendant that I was traveling singlely and with only carry-on luggage, so “please-oh-please could I stay at the airport and try my luck that things might change?”. I was granted this but told not to hold out too much hope. Three hours later, and wonder of wonders, the weather did open up enough for one flight to depart and, lucky me…because I was a single ticket fare with carry on luggage only, I was good to go. It was like being let into some fancy, exclusive New York City Club that had a strict entry code. With hindsight, it was amazing to think how excited we all were to be leaving the island and getting on this one-flight-out. It sure did seem like winning the lottery and, indeed, there were people who were quite annoyed that they were “lost”. We were all giddy and chatty with excitement–even the men–as we hustled across the tarmac. Remember, the weather was still stunningly beautiful this very late Nassau afternoon. Little did I know that I was really as “lucky” as “Jack Dawson” (played by Leonardo DiCaprio in James Cameron’s blockbuster movie) who won his “ticket-to-ride” on the Titanic. Well, perhaps I’m being a little too dramatic here as my plane didn’t go down and, since I’m writing this piece in the here and now, I was not a disaster fatality, but what do you think happened next? We’d barely flown beyond the sight of (is)land when the capital “T” turbulence began…and where had the sun gone, too??? To be short, IT WAS THE FLIGHT FROM HELL!!! And to think I fought tooth and nail to be on this carrier! What was I thinking??? Others were traveling with loved ones but as for me, I was alone. So was the woman sitting next to me…a nurse from New Orleans. Silly as it may sound now, I asked her if she was scared. “Yes”. Of course she was–EVERYONE was! That was all I needed to know. I asked her, then, if she wanted to hold hands. And so we did, all the way across to Miami, chatting non-stop to better feign that we were courageous. We shared a short, but profound experience, and helped each other through. When we arrived in Miami, a bit worse for the wear but okay, we departed company, her to a quickly departing flight to New Orleans and me, to another 5 hour wait-a-thon praying for another window of good enough weather to get me the hell home! I’d never see my “Florence Nightingale” buddy again. I can’t event remember her name now, and we didn’t exchange business cards, either. It was all too intense, raw and surreal an experience for such things. But this much I did reflect and learn from this experience…sometimes, whether at work or in private life, we interface and are deeply involved with others for a short duration and then it’s over…never to happen again. And that’s okay…that’s good. Not all relationships, business or otherwise, are meant to last a lifetime. Business relationships, team bonding experiences and connections, etc., come and they go, too. Some are, indeed, “fair-weather” and some are for the “not-so-fair-weather” times you must endure at work. Some last a lifetime, but many can disappear–just like that–when that “weather” changes…when the workplace crisis or project, or whatever, is over. Whether or not you stay in touch with all the people you meet along the way at work, you will be the richer for the experiences if they were meaningful, productive and authentic…and, whether or not you realize it, a bit of you will stay with them, and vice versa, forever. Perhaps the most important lesson about which I was reminded from my Hurricane Alex flight, however, was that lots of times we’re all scared about something and need to do whatever we can to find our courage to keep a stiff upper lip and soldier on through rough or difficult patches. And, often times, that means finding others–teammates/colleagues, bosses, workplace friends, whoever–with whom to stick together, “hold hands” and “talk” your way through. P. S. I often think about that nurse from New Orleans and say a prayer that she survived and fared well enough through that terrible ordeal of yet another hurricane–Katrina–almost a year to the very day of the “not-so-fair-weather” experience we shared.